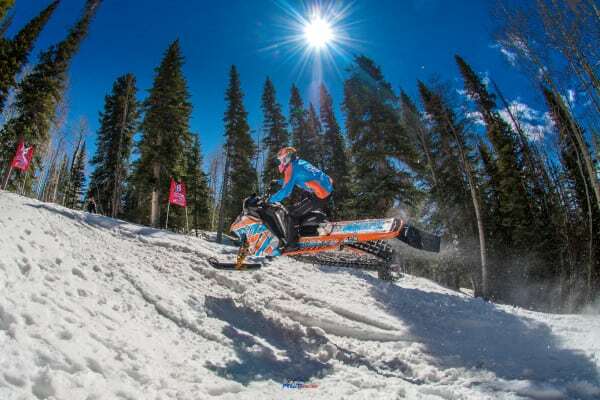 Riders on Polaris AXYS® RMK® snowmobiles won all four Pro Stock classes at the latest RMSHA hillclimb to extend the Polaris Stock-class win streak to 20 in–a-row on snowmobiles like those available to riders today at Polaris dealerships across the snowbelt. With the Stock sweep, Polaris racers won nine of 12 Pro classes, along with three King of the Hill crowns, at the RMSHA hillclimb April 8-9, in Mesa, Colo. In the season’s first five Rocky Mountain States Hillclimb Assn. events, Polaris racers have won all 20 Stock classes and claimed 50 of 60 available Pro podium positions. Polaris racer Keith Curtis has won every Stock King of the Hill title, and Polaris racers have won the 1000 Stock class all five times on Polaris 800 RMKs – outrunning racers on competitive sleds with 850 engines. Curtis won the Stock and Mod King of the Hill crowns at Mesa after winning 600 Stock, 800 Stock, 800 Mod and Open Mod. Andy Thomas won 700 Stock and Luke Rainey won 1000 Stock – on an RMK 800 – to complete the Polaris Stock sweep at the Powderhorn Mountain Resort. In Improved Stock, Kyle Heap won the 600 class and Erin Beukelman won the 1000 title. Curtis earned podium finishes in all five classes he competed in, while Rainey and Beukelman had four podiums apiece, and Andy Thomas and Justin Thomas had two each. Polaris Racer Storm Johnson dominated Semi-Pro racing, winning all three classes (Stock, Improved Stock and Modified) along with Semi-Pro King of the Hill. Shelley Heap won the Women’s Stock, Improved Stock and Modified classes and the Women’s Queen of the Hill crown. Tayler Meyers won Women’s 600 Stock.